Give the gift of gourmet organic grass fed meats this holiday! With all the sweets and treats available this time of year, your friends and family will really appreciate your thoughtfulness in gifting them with healthy and delicious organic grass fed meats. Your selections stay fresh up to a year in their freezer and they can enjoy everything knowing it is healthy, well raised meat without antibiotics, additives, chemicals or preservatives. Our animals are treated humanely and our organic meats also graze certified organic pastures or receive organic feed. We have a Holiday Gift category to make shopping easy. Be sure to shop early this year because the Christmas and New Year’s holidays fall on Wednesdays which limits the available shipping days. If you are looking to avoid GMOs in your food, organic meats are a must. When cattle are raised on certified organic pastures with plenty of room to roam and graze they are free of herbicides and pesticides. When they are certified organic it also means their grasses exclude GMOs. 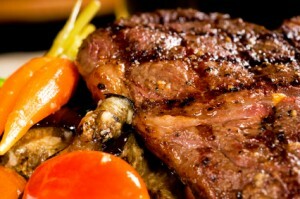 The meat is naturally healthy, higher in Omega3s and lower in Omega6s, higher in CLAs and many other vital nutrients. Learn more about all the benefits of grass fed beef here. New to organic grass fed meats? If you were raised on conventionally raised, grain fed beef you will notice some differences in organic grass fed meats. In addition to all the health benefits mentioned above, you’ll notice that the meat doesn’t have quite as much marbling as conventional beef. This is because they are not fed grains to fatten them before processing. Organic grass fed meats are also much more active and healthy (no antibiotics) as they spend their lives on pasture roaming and grazing (weather permitting). Conventional beef is tightly housed in unsanitary feedlots which limit their movement and require that they be fed antibiotics to stave off rampant disease. The flavor of organic grass fed meats is beefier but not gamey and, depending on the cut, can be a bit tougher. We recommend marinating to increase the tenderness of your grass fed meats. You can learn some tips and tricks here. This entry was written by Jeff, posted on December 5, 2013 at 8:34 pm, filed under Announcements - Holidays, Blog and tagged Christmas gifts, gourmet gifts, grass fed meats, holiday, meat gifts, organic meats. Bookmark the permalink. Follow any comments here with the RSS feed for this post. Both comments and trackbacks are currently closed.